This story was updated at 2:50 p.m. EDT. TransCanada Corp. warned law enforcement authorities of "Aggressive/Abusive landowners" along the path of its Keystone XL pipeline in a recent security briefing that discussed avenues to prosecute demonstrators against its Canada-to-Gulf Coast project under anti-terrorism laws. The PowerPoint presentation given to EnergyWire by Bold Nebraska, a group organizing Plains-area locals against the $5.3 billion heavy crude line, illustrates the extent of the company's preparations to face continued civil disobedience by environmentalists mobilized against further development of the carbon-rich Canadian oil sands. The briefing, dated December 2012, includes names and photos of more than 20 activists arrested for protesting Keystone XL, including actress Daryl Hannah, and cites "landowner court challenges" as one of several "potential security concerns" the pipeline could attract as its northern leg awaits a White House ruling on its construction permit. On a slide titled "Incident History," TransCanada lists a "denial of service" attack it linked to the online hacker network known as Anonymous and quotes Nebraska landowners it suggests have made threats against the pipeline before describing their "level of capability and intent" to follow through as "low." TransCanada spokesman Shawn Howard described the presentation as an effort to share information on the company's previous encounters with anti-XL protesters so that police officers are ready to deter further activity that puts pipeline workers and activists alike at risk. 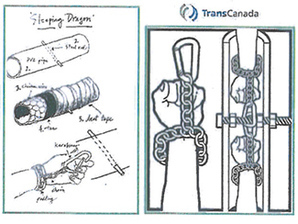 One slide in TransCanada's PowerPoint presentation contains images of the "Sleeping Dragon" and other nonviolent methods that protestors may use to disrupt construction of Keystone XL. Photo courtesy of Bold Nebraska. "During construction, we have encountered a number of confrontations and trespasses on the company's right-of-way (employees/contractors being grabbed, threats of serious physical harm and violence) that have required our company to take additional security precautions," Howard said via email. "This is very unfortunate. Likewise, the way that activists are conducting themselves has diverted local law enforcement resources from the communities they protect or have placed workers and themselves in situations where serious injury could have occurred." A spokesman for the group that has taken a leading role in staging nonviolent demonstrations along the pipeline's 485-mile southern leg, Tar Sands Blockade, blasted the briefing as an "appalling example of collusion between our government and this multinational corporation" to intimidate XL opponents. "TransCanada has never been interested in telling the truth about the pipeline, and now, evidently, it's actively looking to repress the legitimate concerns of affected communities and organizations just looking to amplify their voices," Ron Seifert said. The company's presentation identifies Seifert as one of three "professional organizers" training and organizing on-the-ground resistance, describing him as a "photographer, cyclist, activist broadcaster, and writer." Seifert said he has never taken photographs for the blockade and challenged the legitimacy of other briefing photos that purport to show another organizer training anti-oil sands activists from behind an indoor lectern. "Although they claim we're well-funded, unfortunately, we don't have the resources to rent auditoriums," he added. Bold Nebraska Executive Director Jane Kleeb also disputed TransCanada's mention of a "slap on the shoulder" at a county board meeting in her state as one example of "aggressive" action by landowners. The "slap" was delivered by a 70-something veteran in the presence of a law enforcement official who did not view it as a threat, Kleeb said. "For TransCanada to say on page 4 of their PowerPoint that they build and maintain positive relationships via 'respect and trust' is a joke," Kleeb said via email. "Do they really think we would trust them as they call our guys 'abusive' a few pages over? They do not respect any of us and we do not trust them." Howard defended the company's briefing as justified by the disruptive behavior and arrests that already have occurred on the stretch of XL running from Oklahoma to Texas. "The safety of our workplaces, our employees, our contractors and even the protestors who oppose our work is first and foremost," he said. "If we receive approval to move forward with Keystone XL, we certainly hope that project opponents will choose to voice their opinions peacefully and lawfully -- instead of taxing local law enforcement, the courts and the landowners who live along our pipeline right-of-way." The security concerns presented by pipeline lawsuits stem from TransCanada "having to seek temporary restraining order when [protesters] are breaking the law and trespassing" on the construction corridor, Howard added via email. "If a landowner is challenging compensation or other issues, that's obviously not a security issue." The battle to define the anti-pipeline movement stands to rage on for years, as activists vow to protest against a project they view as a major climate risk even if it wins a permit from President Obama. Large-scale oil sands crude projects are facing "significant timing uncertainty owing to regulatory, environmental, and local community hurdles whose severity was not anticipated," investment firm Goldman Sachs & Co. wrote last week in an analysis bearish on Canadian heavy oil's future without Keystone XL (E&ENews PM, June 10). The TransCanada presentation also uses incendiary terms linking the Tar Sands Blockade to the destructive style of environmental protest known as "monkey-wrenching," after the 1975 Edward Abbey novel "The Monkey Wrench Gang." One slide depicts methods of "sabotaging machinery," including the use of liquid on mechanical equipment and diagrams of a device known as a "sleeping dragon" that makes it difficult for police to separate protesters who have locked themselves to machinery. Seifert strongly denied the characterization of blockaders as dangerous, stressing the group's nonviolent credo. What the pipeline company called a "dragon" is known as "a lockbox" among blockaders, he said. Still, the image of grass-roots rebellion can prove potent; Rolling Stone published a friendly profile of the blockade earlier this year under the headline "Monkey Wrenchers." Another slide in the PowerPoint presentation addresses ways for local law enforcement to prosecute anti-pipeline activists for interfering with construction. "District attorneys may have more information regarding the applicability of state or federal anti-terrorism laws prohibiting sabotage or terroristic acts against critical infrastructures," TransCanada states. "Resident FBI offices can explore federal charges with the U.S. attorney." Climate activist Tim DeChristopher recently finished serving 21 months in prison after his conviction on two felonies linked to fake bids he made during an auction of federal drilling leases, earning cheers from fellow environmentalists at his first public appearance since his release (Greenwire, April 23). Howard of TransCanada also addressed the company's practice of hiring off-duty local law enforcement officers to protect the pipeline during construction, which Kleeb's group criticized last month as "a dangerous line to cross." Such hiring takes place through a third party and is "common practice ... for large events, private gatherings or projects like ours" and would focus only on guarding company property, not pursuing any action against anti-XL protesters, he said.